A couple weekends ago, John and I found time to get away from the daily grind and we decided on a staycay at one of hidden treasures in town. 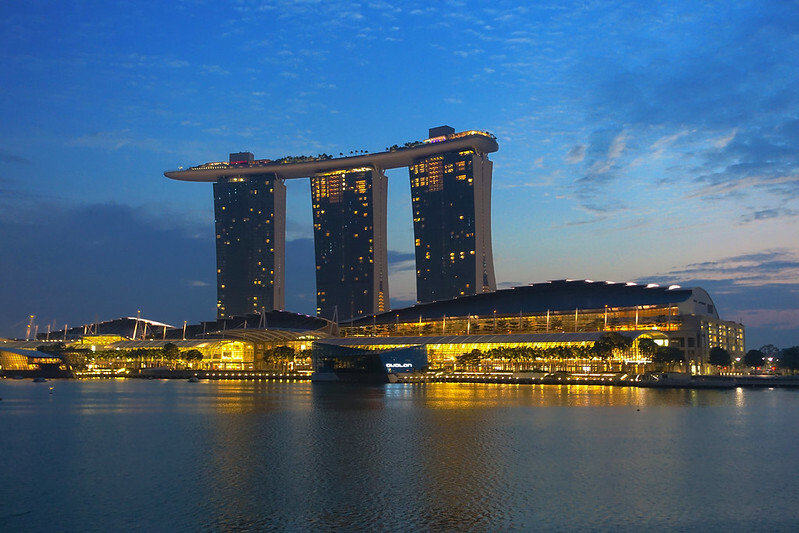 Being regular guests at the MBS hotel, we always wonder about the buildings opposite, the comfort and ambience within, and marvel at the strategic location of The Fullerton Bay Hotel on the waters of Marina Bay. When we finally found a chance to take a breather before the crunch for the Lunar New Year, we packed our bags for a staycay at The Fullerton Bay Hotel which has gained recognition worldwide for its stylish design, luxurious hospitality, unsurpassed views and waterfront dining experiences. 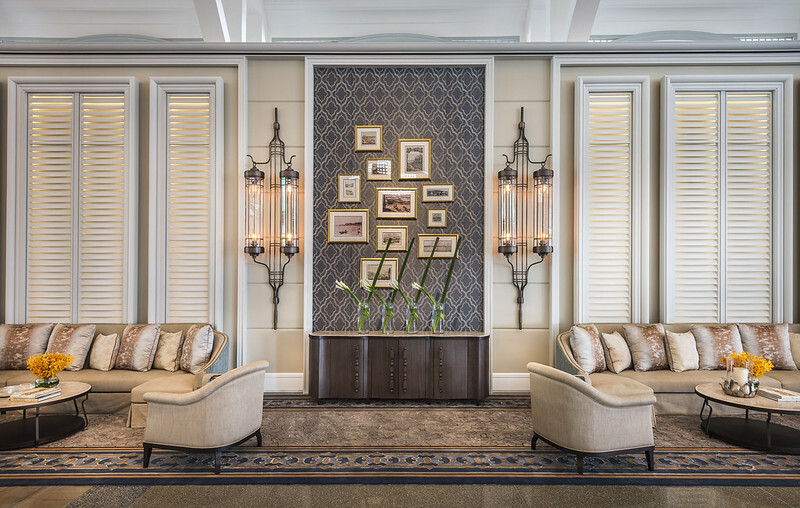 Prominently positioned in the heart of Singapore's Central Business District and within The Fullerton Heritage precinct, The Fullerton Bay Hotel presents a statuesque image with its breathtaking architecture and remarkable interiors with a spectacular view of Marina Bay waterfront to boot. 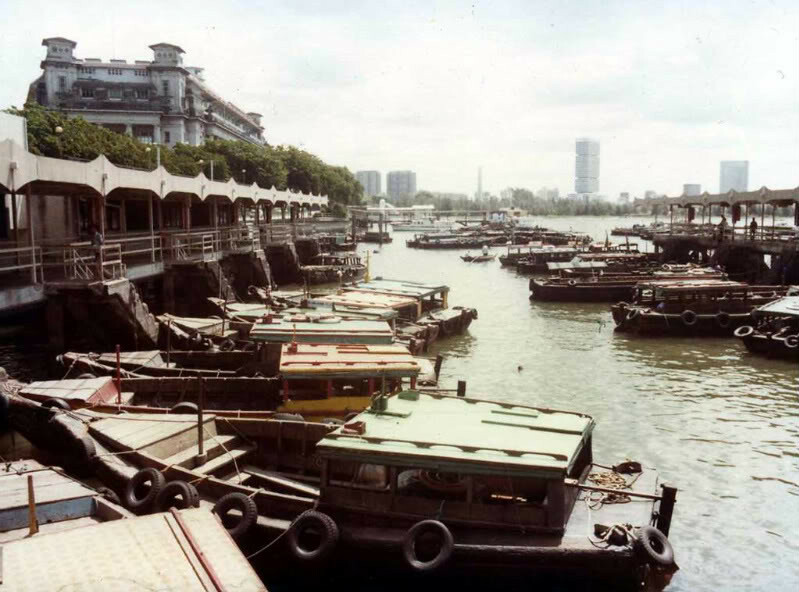 Found out from The Fullerton Bay's Facebook page that The Fullerton Hotel was formerly known as The Fullerton Building, and the majestic Cavenagh bridge used to be known as "husband and wife" by seafarers in the olden days. 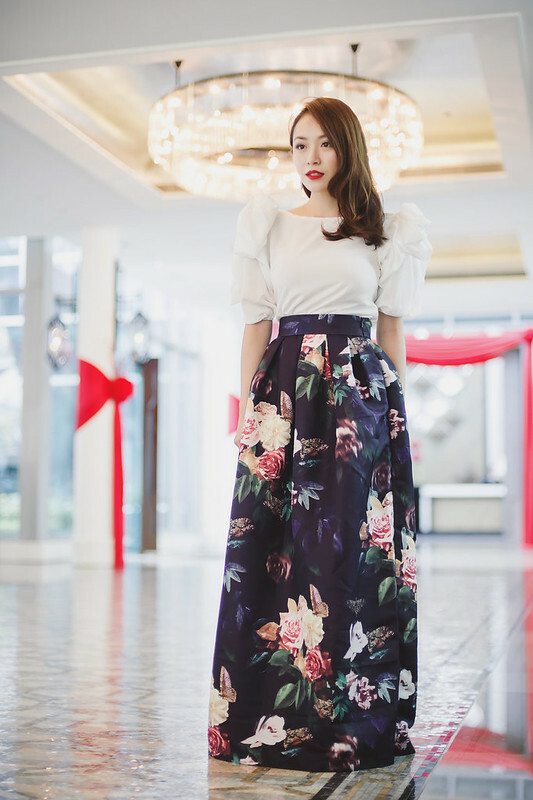 Besides it being a romantic and historically meaningful backdrop for wedding photos, legend has it that if a woman throws an orange into the river on the last day of Lunar New Year, she will find a good husband! Haha, but first, will i get fined for throwing an orange in? 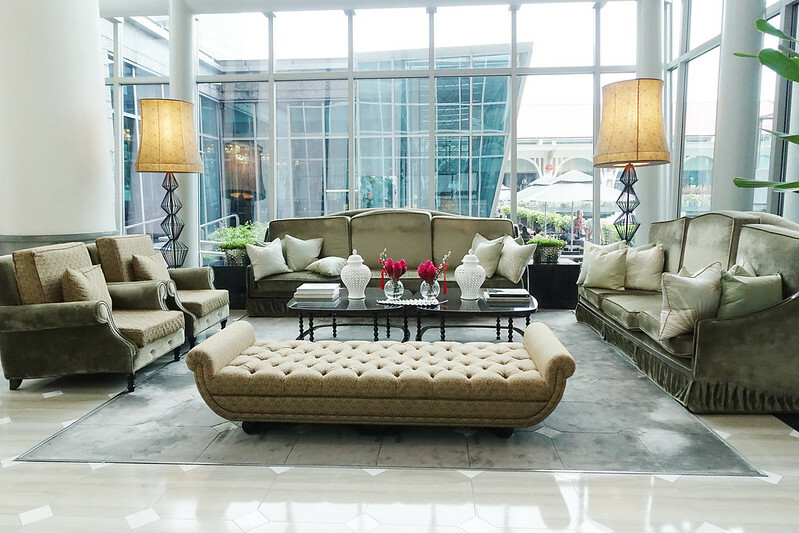 Stepping into the hotel lobby, it came as no surprise why it was the recipient for Best Hotel Experience at last year's Singapore Experience Awards. 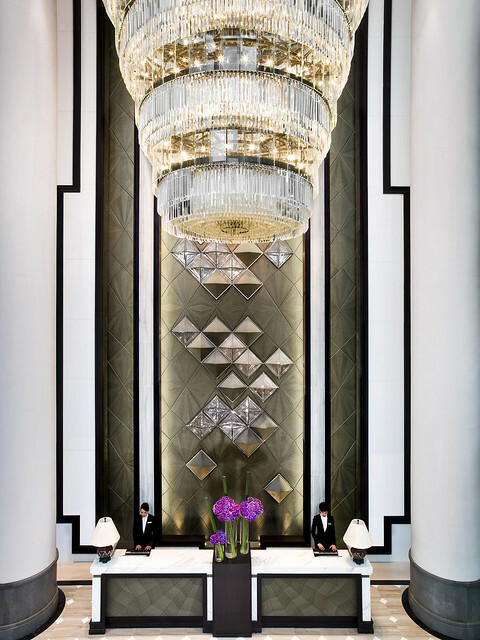 We were overwhelmed by the grandeur architecture which gives a luxurious and elegant atmosphere. High ceilings, wide spaces and bespoke furnishings always win me over. I understand that the hotel is designed in such a way so as to combine the historical with the contemporary to add vibrancy to the area's rich cultural heritage. 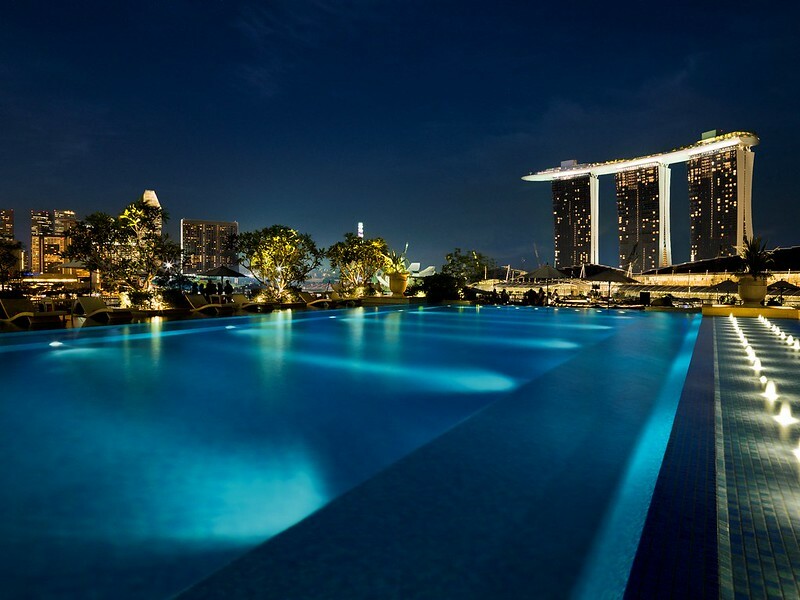 It also features one of the longest waterfronts in Singapore, offering unrivalled views of Marina Bay. 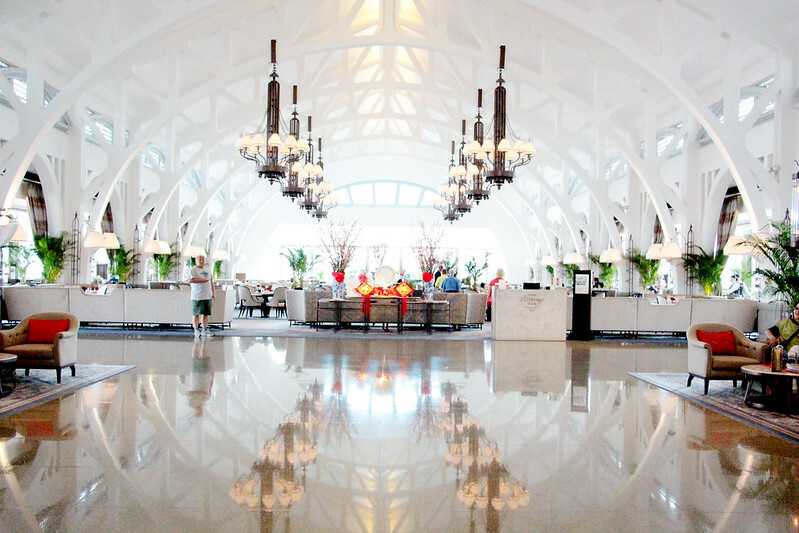 After being received by a concierge staff, we walked through the Landing Point restaurant to reach the check-in counter. 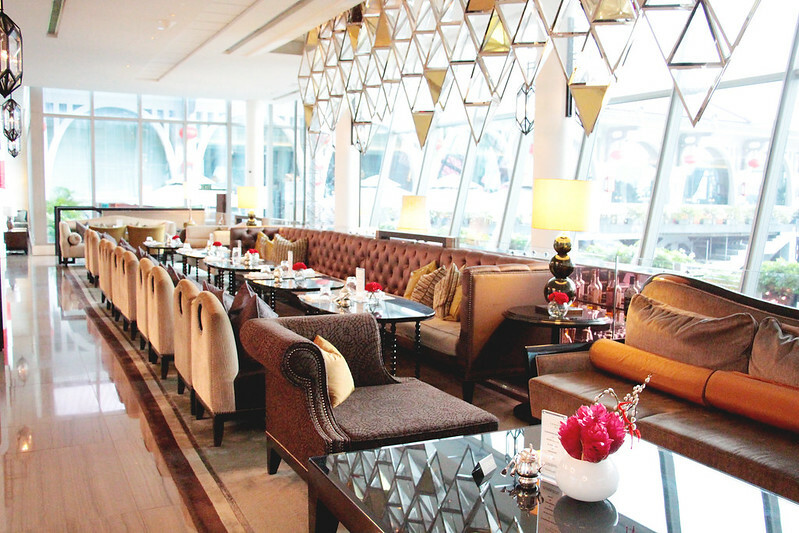 The Landing Point is one of four eateries in the hotel. We were awed by the beautiful rich marble in the varying tones of mineral greys and complimenting bespoke furnishings in soothing and lush olive greens, burnt orange and deep aubergine shades. It kinda built the anticipation of us arriving at our room so we could start indulging on our weekend. Not knowing what to expect at the check-in counter, we were pleasantly surprised to be greeted by our names and due to the exclusive number of rooms they have in the hotel, the check-in procedure was peaceful, hassle-free and quick as compared to other hotels we have been to in town. 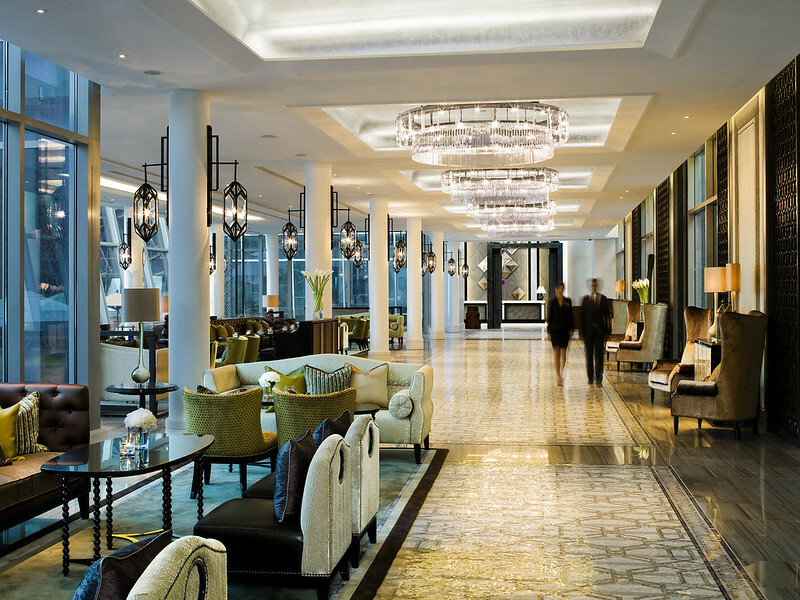 Once we checked in, we were accompanied to our room by a pleasant lady from the concierge. To say we felt exhilarated when we first entered our hotel room is an understatement. With the floor to ceiling glass windows (can't emphasize how much I love floor to ceiling windows) which allows natural light to stream into the room and the sense of space, it is so luxe and yet cosy for a weekend stay. The warm and subdued hues in the room and can I mention, the finest Egyptian cotton quality bathrobe (the best I have ever worn in so many hotels) exudes comfort and sophistication and was the perfect place for us to get away from the buzz and recuperate in luxury. 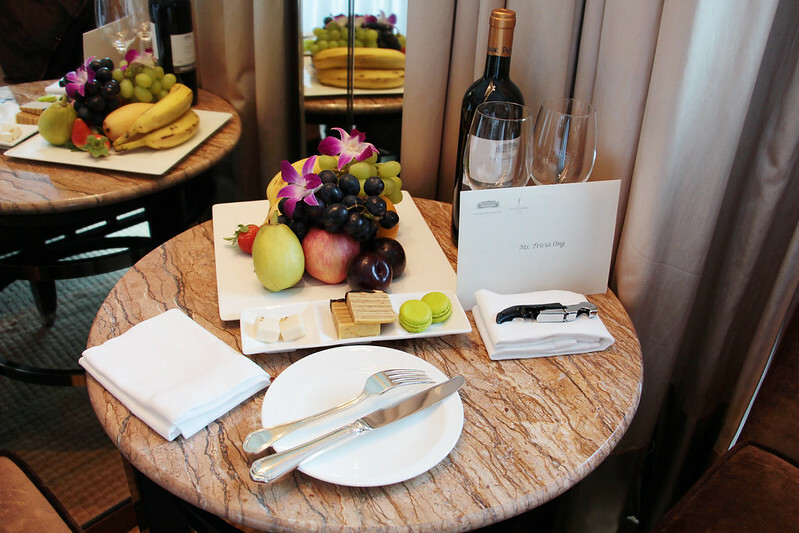 We were also given complimentary fresh fruits and desserts as a welcome gift. We found ourselves lounging on the couch, enjoying the fresh fruits and indulging in the experience; which was a nice break from the usual routine of checking in and immediately rushing to unpack our bags. There was much to discover in the room. 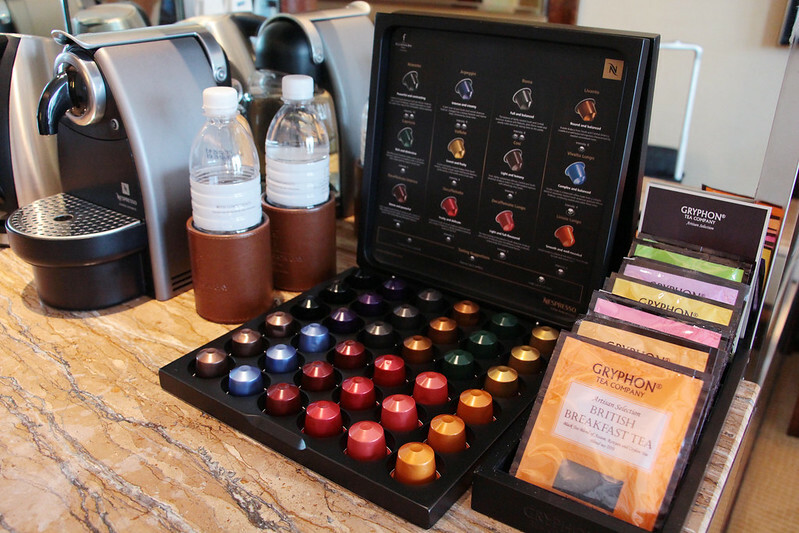 The attention to detail is immaculate with in-room coffee machine, wide selection of Gryphon Tea (my favourite Tea brand aside from TWG), flat-screened television at the foot of each bathtub and branded shower accessories like the range of bath amenities from the Bvlgari Red Tea collection. The collection creates an experience of warmth and absolute indulgence. 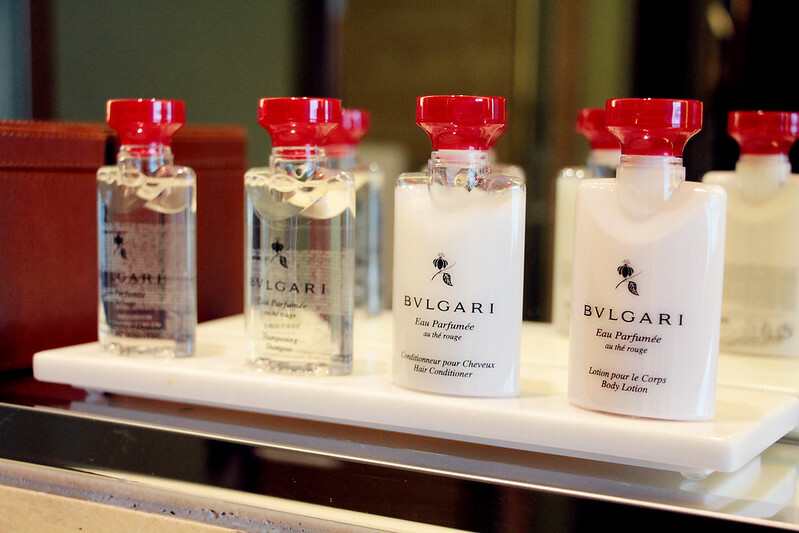 I rarely use bath amenities from hotel and tend to bring my own along but this well-appointed range from Bvlgari really takes the cake. In fact, the scent from my shower lingered on my long into the night. 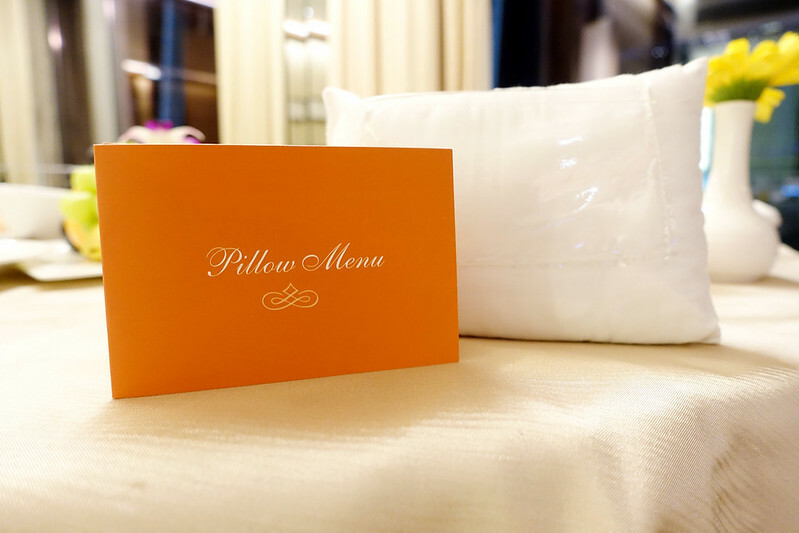 For those of you who are fussy sleepers, you'll be pleased to know that The Fullerton Bay Hotel actually provides a Pillow Menu! There were a few types to choose from; such as contour neck, micro-gel, latex and even a jade pillow. John and I actually considered it but the original pillows they gave us were already very comfortable! There was this little bear in the room which we learned was one of three 'signature' bears that each Fullerton Hotel has. 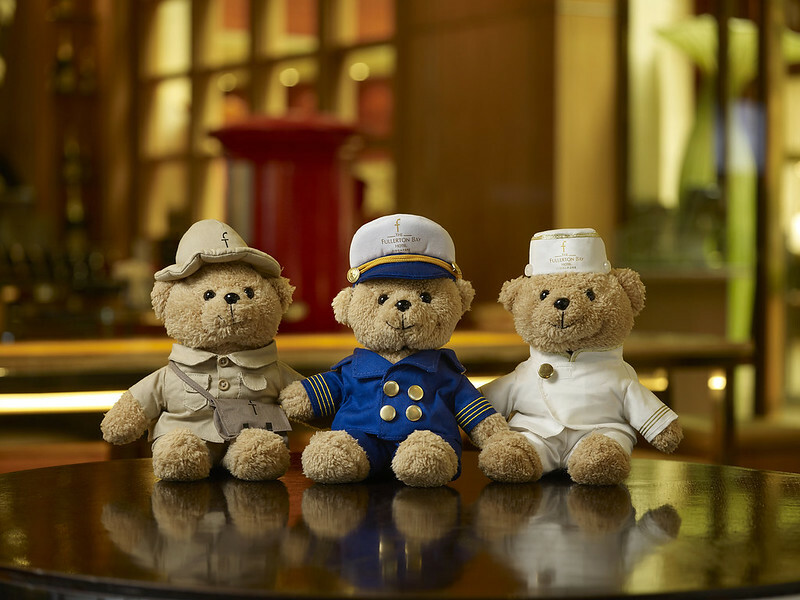 There is the sea-faring Captain, representative of the Fullerton Bay's past, the Postmaster Bear, to signify The Fullerton Hotel's history of being home to Singapore's General Pot Office back in the day, and the classic Porter's uniform of the hotel. The bears can actually be bought and you would be pleased to know that for each sale, a portion of the proceeds goes to the MILK (Mainly I Love Kids) Fund, which helps disadvantaged children and youths in the society. To us who love having a balcony in comfort of our home, it is an absolute luxury and definitely a coveted one to enjoy an exclusive balcony with the majestic skyline for a view in our hotel room. 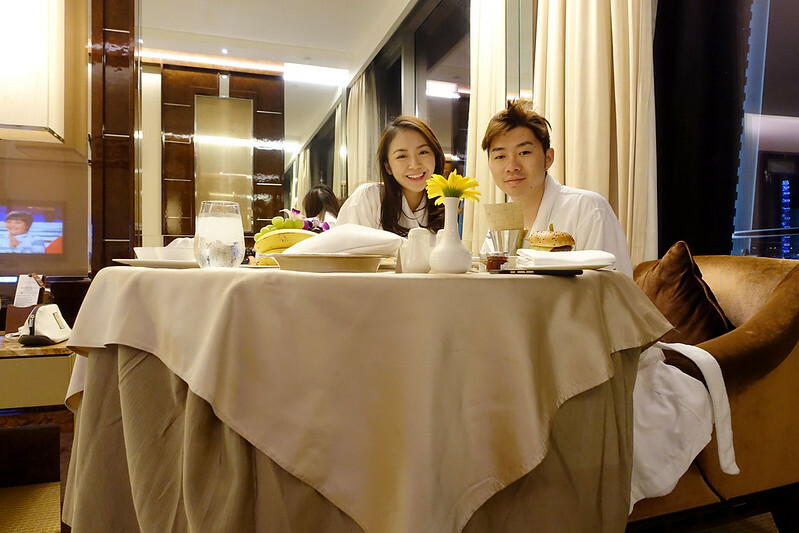 We decided to soak up the view so John and I ordered room service for dinner and this spot right here became a cosy corner for us while we enjoyed the Marina Bay light show and had a good heart to heart talk. John and I in our Egyption robes that we stayed in the entire time when we were in the room. We woke up the next morning to explore the hotel for a bit and carried out a mini VGY photo shoot. With such a reputable location, how not to snap a few shots! We decided to hold the shoot at different locations in the hotel, of which some were at its eateries. 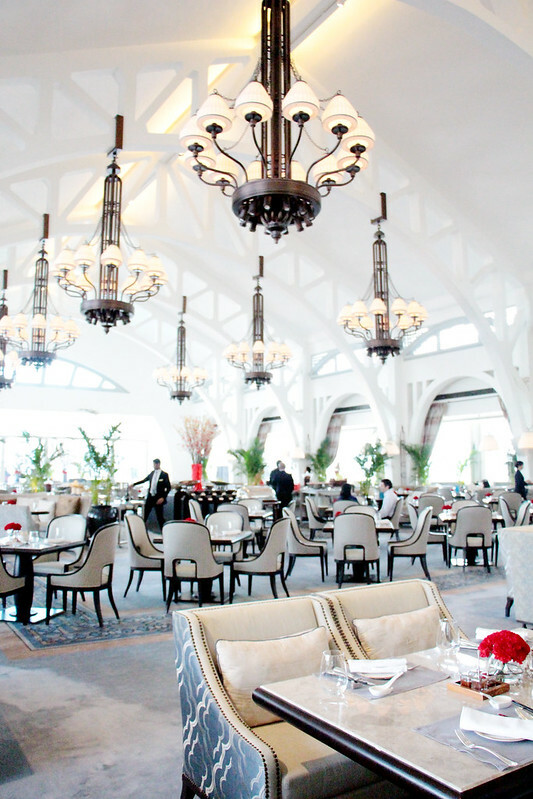 Fullerton Bay Hotel has 4 eateries; Clifford Restaurant, Clifford Pier Restaurant, Lantern and Landing Point. 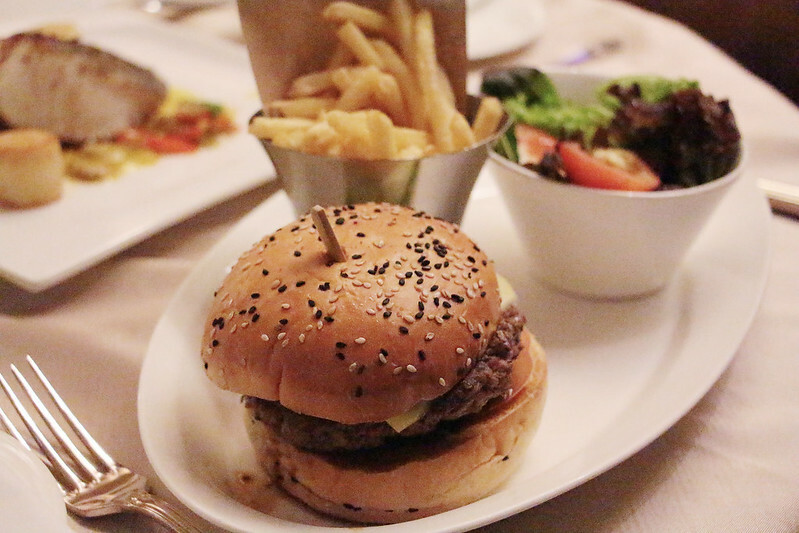 We only managed to dine at Clifford Restaurant but here is some information for those of you who are interested in dining at these established restaurants. 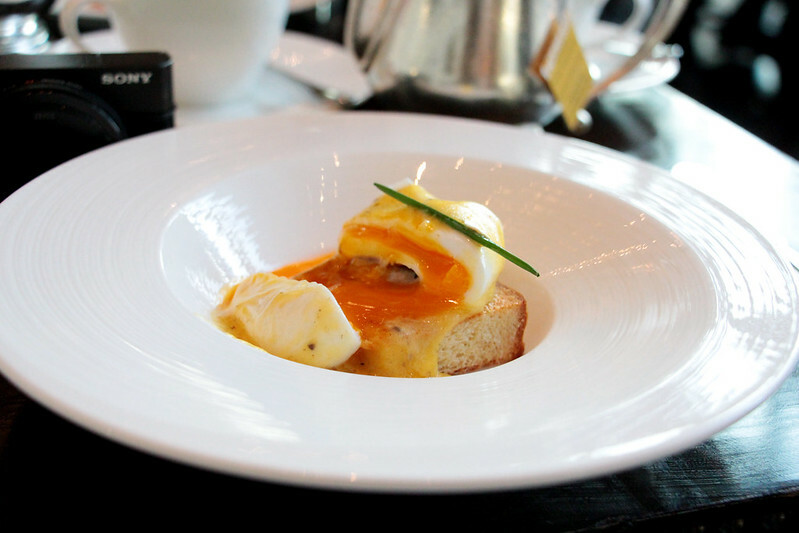 Breakfast was served at Clifford Restaurant, a sanctuary of elegance and epicurean excellence. I cannot marvel enough on the delish French take on "Egg Of The Day" with foie gras and truffle hollandaise. The restaurant was lit up by natural morning light streaming in from the majestic ten metre high floor-to-ceiling windows, and the giant gorgeous dual patterned curtains cascading down from the ceiling to the oak floors. 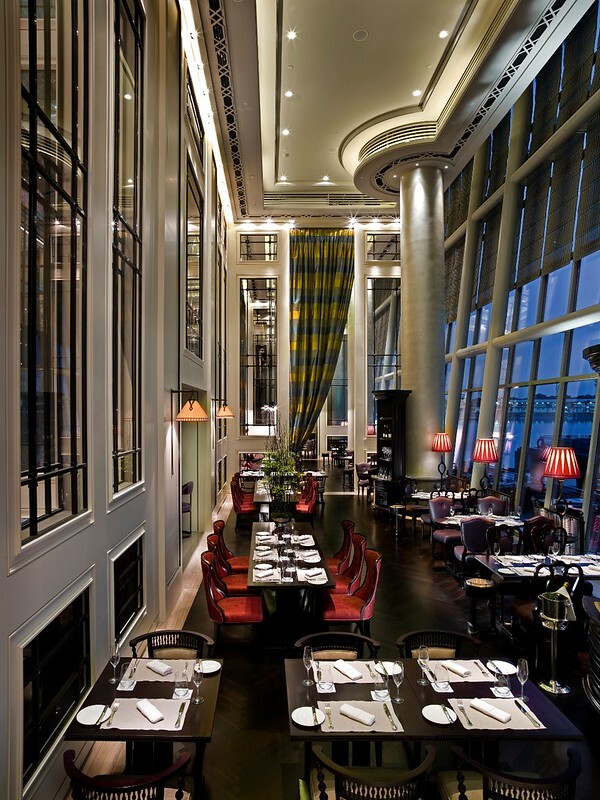 Isn't this brasserie just beautiful beyond words? Even the entrance of the restaurant had elegant furnishings on the walls. My table captured in the morning light, unedited and raw as it is. It is arguably one of the most romantic restaurants I have been to. 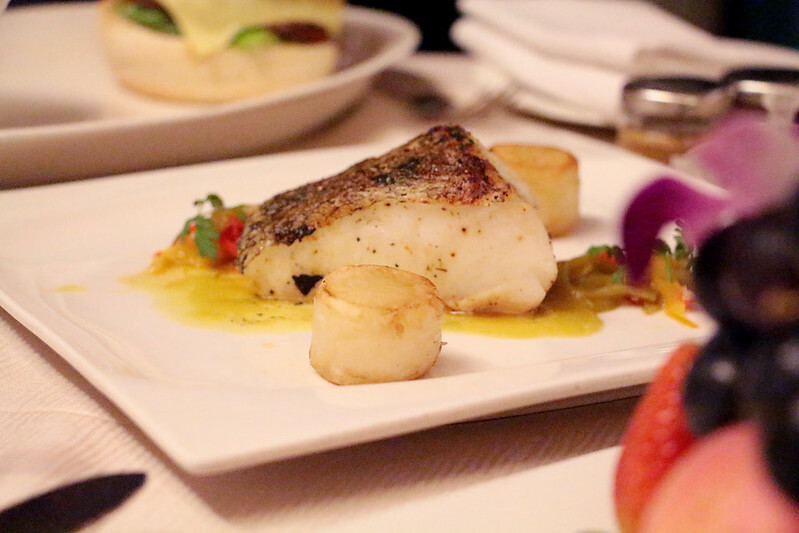 I would strongly recommend this place as a dining destination for couples looking for a romantic restaurant to celebrate a special occasion. 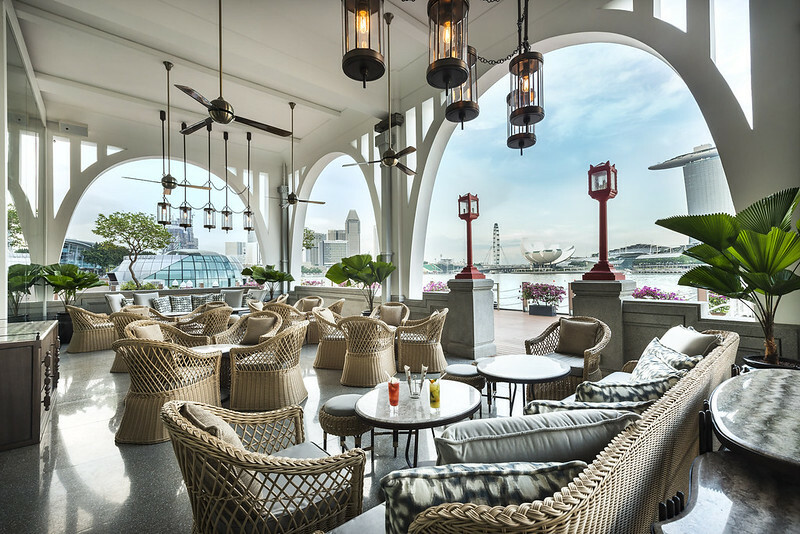 Not to be confused with Clifford Restaurant, the Clifford Pier Restaurant and its alfresco dining area (as seen below) were newly unveiled in May 2014. This would be the most prominent of restaurants as it is the first thing you will see as soon as you step into the hotel. Came to learn from the hotel staff that this restaurant is often booked for events; the most recent being the launch of Huracan for Lamborgini Singapore. So I'm sure most of you can guess what Clifford Pier Restaurant was named after. Clifford Pier in the past was a busy landing and departure point during the pre-air travel era! 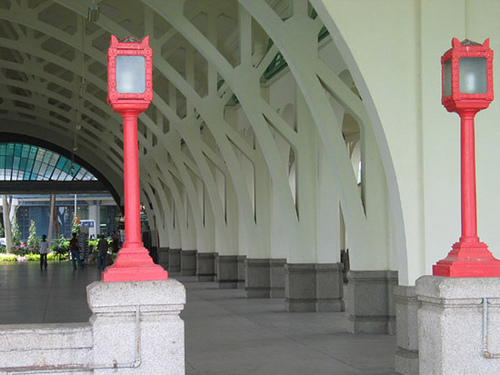 Today, Clifford Pier has been replaced by Marina South Pier and is conserved and redeveloped as part of Downtown Marina! And this is how Clifford Pier (or should I say Marina South Pier) looks like today! This definitely looks like a nice place to enjoy a quiet morning over tea. 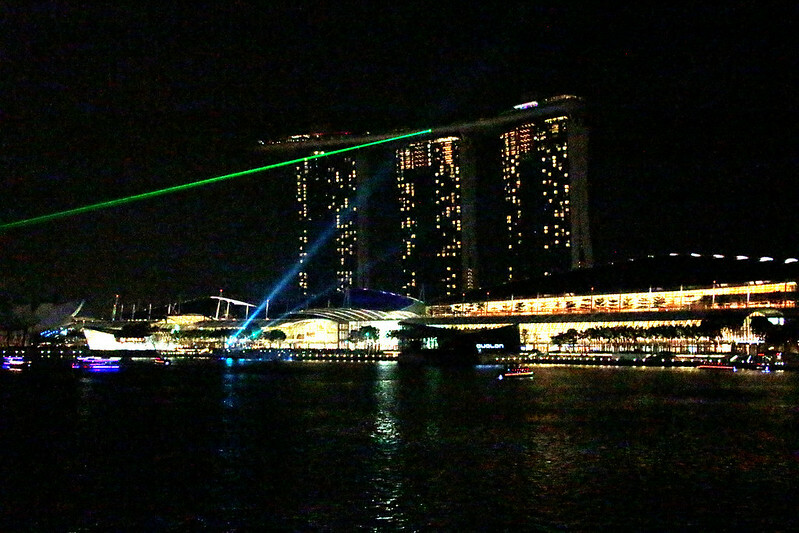 One more thing we learnt from the staff here is that this is a great place for fireworks as it overlooks the Marina Bay floating platform! 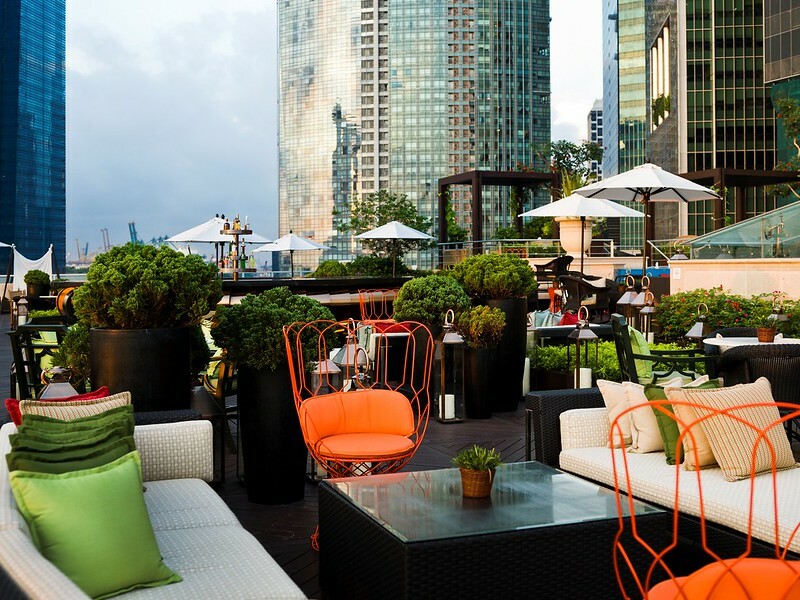 For those of you who like a good view, Lantern is a stylish rooftop bar which gives enthralling views on the city skyline. 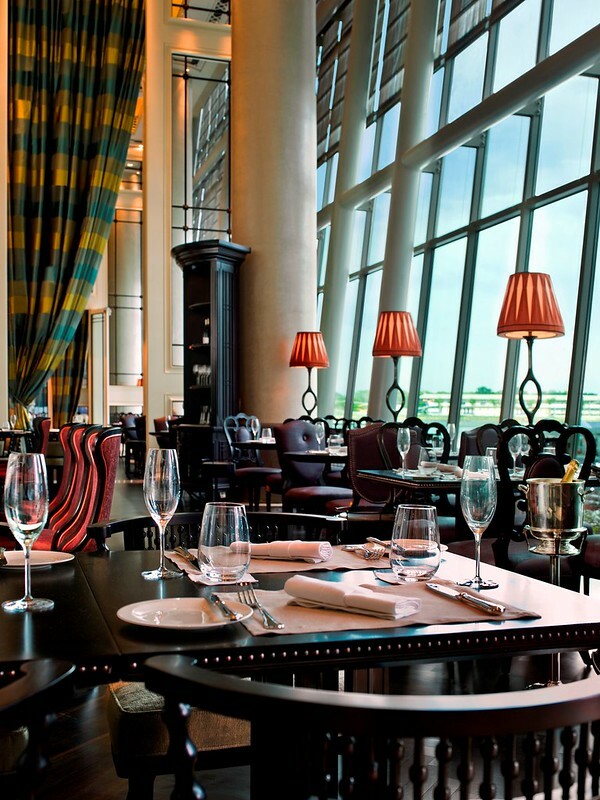 According to them, it is recognized as one of the top best hotel bars in the world! Other than enjoying some tapas and cocktails, guests can also enjoy a relaxing dip in the 25-metre wide pool. 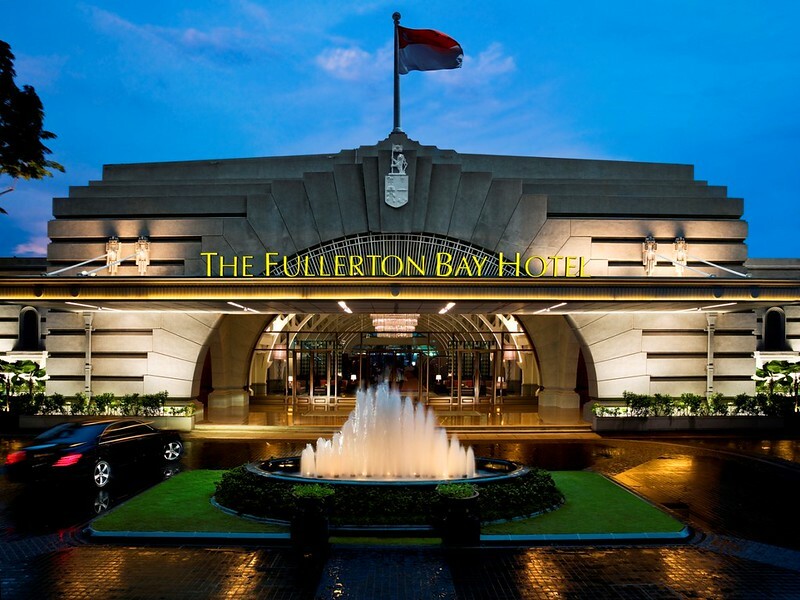 For those of you who cannot decide between The Fullerton Bay Hotel and The Fullerton Hotel for its facilities, something interesting for you to note is that guests are actually able to use facilities from both hotels during their stay. If I had more time during my visit, I would have loved to have popped by The Fullerton Hotel to see their iconic swimming pool with huge Doric columns as well. The Landing Point restaurant derived its name from the long passage way which the settlers had to walk on upon stepping foot at the pier. 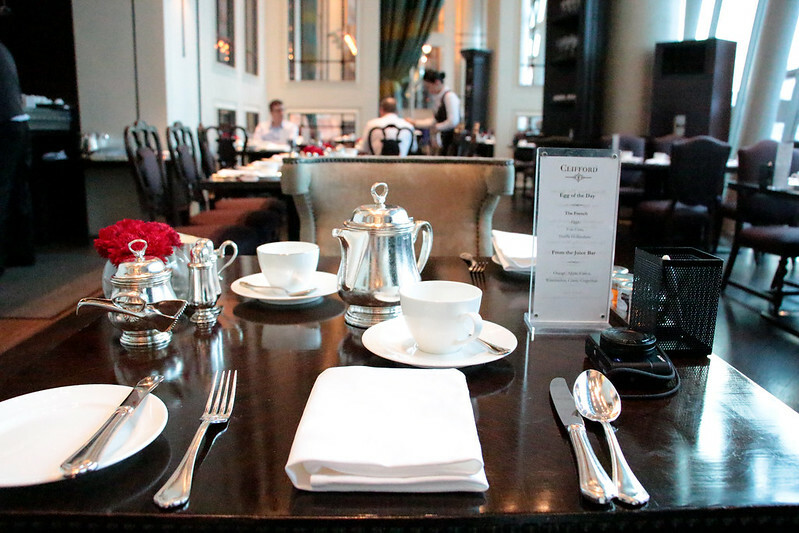 Some of you may have heard of this restaurant as the go-to-place for high-tea. 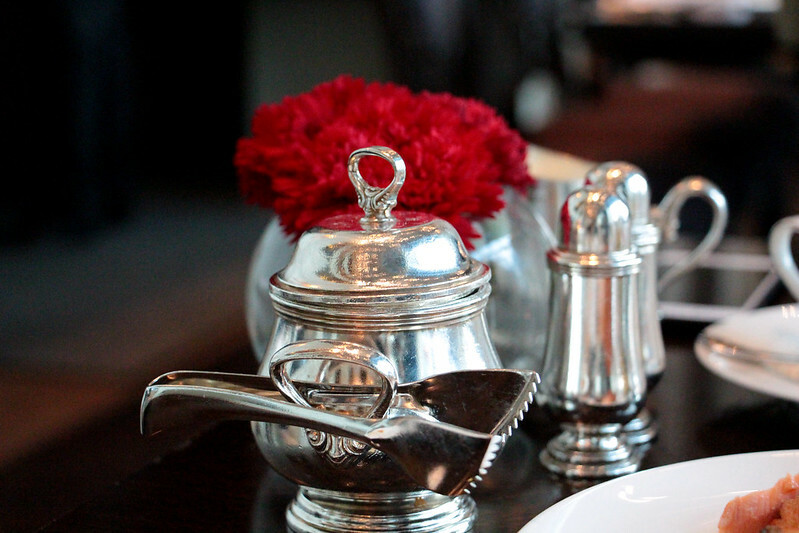 Prior to this hotel stay, John and I have always tried to book a table for high tea on Sundays at Landing point (on Sundays itself) after hearing so many rave reviews but it was always fully booked. We still have yet to try it but definitely will not give up! Having experienced the hotel's great service and food at Clifford, I can't wait to spend another Sunday afternoon with John here. Our stay was rather short (one night) but it was still a great experience for us. We will definitely be back for another staycay (a longer one hopefully) because the experience was exceptionally different. What makes a hotel stay even more memorable is definitely the ambience, the environment, the decorations which all plays a part in creating the best experience. One extra touch that made our hotel stay magical was the discreet and personalised service in this hotel as compared to big and overly commercialised hotels. The other main factor was the strong symbolic history that the hotel had. During that stay, I learned quite a bit about our country's history and it reinforced how much Singapore has grown through the years. P.S. : A staff at The Fullerton Bay Hotel informed me that heritage tours are conducted upon request so guests can learn about the historic setting of The Fullerton Heritage precinct wherein lies 7 establishments namely (1) The Fullerton Hotel (2) Fullerton Waterboat House (3) One Fullerton (4) The Fullerton Pavilion (5) Clifford Pier (6) The Fullerton Bay Hotel and lastly (7) Customs House. Even as a local, there are things about our history that I still find myself learning till today. 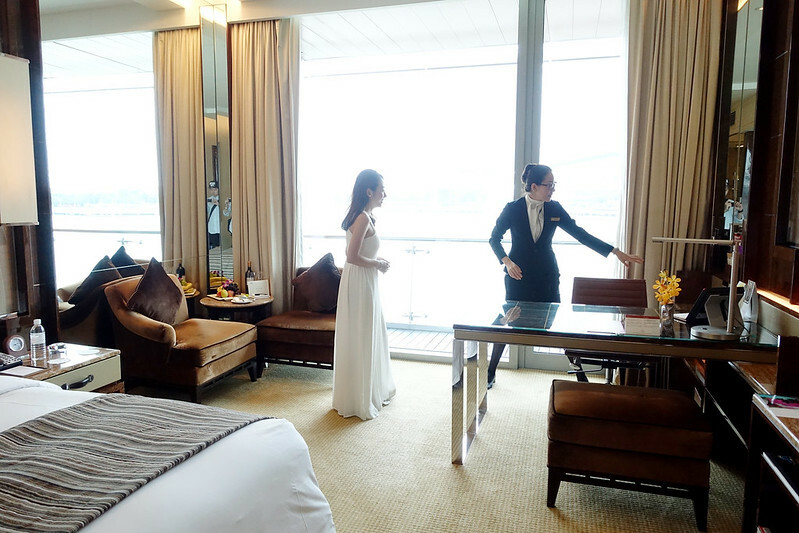 I think the tour is a great additional service as it helps enrich guests with the deep tradition that lies within the very walls of The Fullerton Bay Hotel and that dates back to the early years of Singapore.